In this article, we’ll cover the essentials of dog ramps, when exactly they are necessary, and how to choose the most appropriate one for your four-legged companion. We strongly encourage you to read through these concise, yet, informative guidelines before you go straight to the top picks available on the market today. For your attention, we cover both pet ramps for cars and beds in this article (each has a separate paragraph dedicated to it). To navigate this article more conveniently, use the table of content below. You mustn’t wait for a certain hip, joint, or other injuries to start giving a thought to a certain kind of ramp for your pet. First, let us go over some examples when a dog ramp is an absolute must to prevent further health issues. Joint issues and hip injuries. Appropriate ladder or ramp will not only prevent further joint-related issues and injuries but will also help recover from such. Doesn’t mean you should stop using the ramp after “the pain is over”, though. Senior dog. Senior dogs are more likely to have the aforementioned joint or hip issues, or any other health problem, for that matter (e.g., develop arthritis which makes these swift movements painful). Even if your individual shows no clear signs of serious problems, prevent it from becoming a reality – a suitable ramp eases aches and reduces the chances of injury that could have otherwise been preventable. Certain (small) dog breeds. If you own such breed as Dachshund, it should be no surprise to you if your short-legged friend experiences serious back issues (pain) throughout its life. Sadly, there’s not much you can do to eliminate this problem completely and irreversibly, however, one of the things you can and must do is to support your friend’s back by not having him jumping in the car, on the sofa, or elsewhere where the height for such breed is inappropriate, but obtaining a good ramp or stairs so that your little fella can enjoy running and going on rides with you. There are more to this, for instance, dog ramps can be used for certain training as well. Anyhow, if at least one of the aforementioned pinpoints is a reality in your household, you must take it a step further – meaning, stop just thinking about a dog ramp, but actually get one. However, before you do, make sure you know what you’re getting. Hence, keep reading this article and soon enough you’ll find the most suitable ramp for your individual fella. You may’ve not thought about this, but, in fact, ramps for dogs can be used for various purposes, not just when transporting an old or very small in size four-legged fella. If you think about it, the same dog car ramps can be used for training purposes as well. You may’ve heard about certain dog training and tests, especially if you’ve given a thought about honing the skills and behavior of your own pup – one of the standard training tests is making the dog climb over such ramp and avoiding the detour. Ramp’s length vs. height of the car. A longer ramp is more compatible with higher vehicles. Additionally, consider a longer ramp for older dogs or ones with aforementioned issues as these kinds of ramps make less challenging incline. Ramp’s width vs. size of the dog. Simple as that – the bigger (wider) the dog, the wider should be the ramp. Also, untrained and sort of skittish dogs may be resistant or unable to climb too narrow ramp. Sturdiness and weight capacity. Look for a ramp that’s sturdy and can handle your four-legged friend for certain – most manufacturers should have pointed out the maximum weight capacity. Good grip with the paws. With previous points in mind, look for a non-slip surface. Good grip on the slope becomes even more important in wet weather conditions. The ramp should provide a great stability. Weight and handiness of the ramp. Though secondary consideration, if possible, look for a ramp that is easy to fold, is relatively lightweight (yet, sturdy) and doesn’t cause too many (back) issues to yourself as some ramps can be a bit “tricky”. Furthermore, consider the size of your trunk as you should take it along with you – your dog needs the assistance when getting out as well. Keep all these points in mind and go over each criterion in your mind as the best car ramp for dogs depends on your individual considerations – do you have a large breed or a small one; do you have a high SUV or a low sedan, etc. In such manner, you’ll go from “universally best” option to the perfect solution in your individual case. Measure the height of the access point in your car whether it’s the trunk or side door and look for an appropriate option to make a comfortable angle with the ramp, otherwise, the main purpose of supporting your dog is kind of lost. And now, without any further ado, let’s take a look at some of the best options you should consider with a solid knowledge in your minds now. Quite a unique dog car ramp that meets all the main criteria and works really well when used appropriately – a dog car ramp by Gen7Pets. First off, it’s really sturdy yet lightweight (weighs 17 lbs). Yet, it can hold up to 250 lbs (!) dogs, while it is easily foldable and comfortable for the owner as well – that’s something rare since, usually, the more durable dog ramps are also quite heavy. Dimensions: although we don’t usually focus or even mention exact dimensions of the products we review, in this case, it’s essential. So, they are as following: 72″ long x 16″ wide x 1.5″ thick (when folded, 36″ long x 16″ wide x 3″ thick). As you can probably tell, it’s wide enough for both small to large dog breeds, yet, might be somewhat limiting for the most clumsy + extra large ones. You might be surprised, but some dogs are initially afraid of some rubber or plastic ramps. Not the case with this one – the realistic “grass” cover gives a natural feel to the paws while also providing the necessary stability and grip (disclaimer: though the grip is very solid, there are other ramps that do offer even better traction with the surface). Because of the comfortable surface, even pups that are afraid of stairs and such will find this an encouraging tool. Overall, we like the concept of this dog car ramp the most. The only small drawback is the caution when it comes to folding the ramp (! ): Although we like the overall design, unfortunately, it’s constructed in such manner that you have to be careful when folding it up by gripping it in the middle – as it’s quite long, it looks like the logical thing to do, however, you can injure your own fingers when both parts are slammed together. Therefore, be careful – close it by the edges or “rework” it a little bit by adding handles/straps at the edges accordingly. HM tip: Consider this an excellent choice not only for somewhat skittish dogs but also the ones that don’t really pay attention to the surface they’re walking – their paws and joints will be thankful all the same. Speaking of even larger and clumsier dogs, we recommend checking out a ramp by Solvit – XL version. Not only is it wider (20″) than our previous pick, it’s also longer – 87″ when drawn out fully, thus making it an excellent choice in such combinations as an SUV + large dog breed. Some claim it’s rather heavy, yet, given its dimensions, we actually consider it a lightweight product – around 20 lbs. The magnificent traction is ensured by the well-made surface (think of coarse sandpaper). As for the weight capacity, there’s not even a necessity to throw numbers around – you can walk the heaviest dog in the town, it won’t flex! In fact, even its lighter/smaller counterpart by Solvit holds up to 400 lbs of mass. The ramp itself is not really foldable, although you don’t have to transport it fully extended either. Nevertheless, transporting Solvit (XL) Telescopic Dog Ramp may be a huge issue for some. With that being said, know the parameters of your car first as this isn’t the cheapest purchase. If it fits, this can be seen as one of the best joint assistants to your great beast. HM tip: If it fits in your vehicle, consider this one of the very best dog car ramps for large breeds on the market today. Given the material, overall built, and the price, it can also be regarded as one of the best price-for-value in the category. Here’s a slightly different version when considering the best car ramp for your dog – collapsible dog ramp by Titan. Like its counterpart by Solvit, this one is also not foldable, however, it’s “slidable” – meaning, it can be compacted by sliding each part over the other. The textured rubber surface design provides a respectable grip, and, although the base construction material is a sturdy aluminum, we, again, consider this a delightful lightweight product (in fact, this is the most lightweight product on the list – only 13 lbs). The maximum weight capacity is 180 lbs – comparatively less than our first two picks, yet, should be sufficient for most dogs. The length goes anywhere from 28″ to 61″ depending on how much of its “potential” you use. As for the width, it’s 13″ when fully drawn out – again, should be sufficient for most, yet, might be somewhat limiting for some wider and clumsier pals. On the other side, most cars should quite easily fit this one in. Overall, this quality car ramp for dogs definitely deserves the attention (we wouldn’t recommend it for very high cars, though, as the incline might be too steep). HM tip: Consider this a nice lightweight option for dogs who are at least somewhat well-coordinated as it might be somewhat narrow for the clumsy ones. Also, consider the factor that it might be somewhat steep when used with a higher truck (an average hatchback, however, should be perfectly fine. As much as we’re talking and emphasizing the great aid of car ramps for dogs, there’s a slight alternative that might be even more suitable for others who look for an even more increased stability than a typical ramp – multi-step ladder “ramp”. The weight it can accommodate, however, is somewhat limiting compared to our top-picked dog ramps – anything over 170 lbs should clearly look for a different solution. Then again, how many dogs weigh over 170, or even 150 lbs? Beware, however, that you have to know the dimensions of your car in advance again (the width of this product is 17″). You can choose from 3-step (16″ to 20″ vehicle height), 4-step (20″ to 30″), and 5-step (29″ to 40″) versions depending on the necessity and compliance to the car. Other than that, it’s very easy to use, fold, and carry around. Again, we’ve chosen a sturdy yet relatively lightweight product (17, 21, and 26 lbs accordingly) that we think is best for both dog and the owner. As for the grip, it’s solid – maybe not as outstanding compared to our first two picks, yet, good enough to satisfy most – the ladder is 90 degrees horizontal after all. The bottom-line – it’s not slippery. Some dogs prefer stairs over ramps, and if your traveling companion doesn’t have very serious hip issues, this might be an even better option for some. HM tip: If one of the options (models) fits with your car and dog’s needs, consider this one of the best dog car stairs available now for dogs up to 150 lbs. On the road is not the only time your four-legged friend might need some assistance to avoid joint and hip issues. With that being said, dog stairs for beds are more specifically intended for older dogs with hip or joint issues, or smaller dog breeds, such as Dachshund and others, for whom the height of the bed is troubling and may cause aforementioned or back issues. We also recommend taking into account similar considerations and criteria as for the car ramps where applicable. Here are a few options we believe are worth your attention when it comes to choosing the best dog bed stairs that also make a nice furniture element in the house. Definitely, a quality piece, this oak-based ladder for dogs (and cats) is more than just a marvelous piece of your house’s interior – it supports dogs up to 300 lbs providing a non-slippery and stain-resistant surface. It’s 23″ (5.5″ step height) high and 16″ wide which makes it suitable for both small and large dog breeds. As the entire perimeter rests on the ground, it’s very firm and stable. Be sure to check the height of the bed in advance so that it matches up with this ladder (or is slightly above). If you are looking for a slightly smaller version, check out this 17-inch counterpart by Premier Pet Steps. There might be only two, yet, quite significant drawbacks to some. First, its portability – it’s quite heavy (~40 lbs) and not easy to move around. Second – the price is not as appealing as the product itself. For these reasons, we strongly encourage you to evaluate your situation – if you have a senior (or younger) dog with hip and joint issues, or you own a dog breed like Dachshund who in general are infamous for their back pain, this ladder is highly recommended. Otherwise, it’s just a nice well-looking piece of furniture. HM tip: Consider this a great aid for dogs with the aforementioned back, hip, or joint issues that will likely fit well in your interior and will be appreciated by both guests and the user, your four-legged companion, itself. As we’ve implied before, such dog breeds as Daschunds, Basset Hounds, Cocker Spaniels, and Beagles are, unfortunately, predisposed to serious back issues. If you’d like read more on the topic, we suggest this article on Slipped Disc, Bad Back, and Muscle Spasms in Dogs. However, there are some things you can do to minimize the risk or ease the pain. As our dear companions love laying next to us on the sofa, one of the things we can do is to provide an appropriate ladder to assist these little fellas to get in and out of these beds or couches. 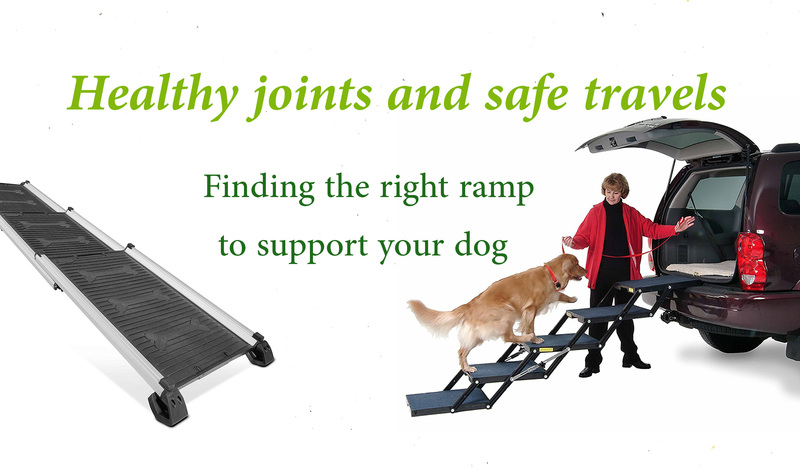 This specific product is suitable for the aforementioned dog breeds; In general, can be applied to small/medium-sized ones – definitely not for heavy large breeds with (also) aforementioned joint and hip issues (for such, please consider Premier Pet Steps or a similar cheaper alternative). Just for the record, the dimensions of Solvit PupSTEP Plus Pet Stairs are as following: 24″ deep, 16″ wide, 19.5″ tall (each step ~4.8″ tall). Please check how it matches up with the sofa/bed. The manufacturer states that the weight limit is 120 lbs, however, we would actually not recommend anything above ~50 lbs. Therefore, it’s quite limiting to be used safely, meaning, to stay stable and be the intended aid to the back and not the injury. Another thoughtful idea that has been implemented in this model are the safety rails (sides) to avoid an accident. Furthermore, it’s foldable and requires no assembly. Overall, it’s a really good lightweight (plastic, in this case) solution for small dogs that weigh up to 50 lbs (preferably, even less) – one of the best price-for-value in the subcategory for sure. HM tip: Consider this a marvelous choice for the aforementioned small dog breeds up to 40-50 lbs with back problems. Here’s quite a unique product that deserves to be on the top list because of its quality, functionality, and originality. Pet Studio Pine Frame Dog RampSteps can easily transform from stairs to a ramp, and vice versa, making an adaptable solution for your pup’s spinal or joint issues. Unlike the previous pick, the main material is really sturdy mahogany that will actually hold up the pets of 120 pounds (we do not recommend much more, however). You can choose from the 2-step and 3-step models, however, we recommend the latter in most cases as it’s easier on your companion’s joints and back (as the height of each step is lower; As for the overall dimensions, it’s 40 x 17.5 x 19.5 inches for this, 3-step version). The carpeting on each step is also very nice and, more importantly, non-slippery. Moreover, it’s quite easy to clean, too. Also, it’s foldable, therefore, it shouldn’t cause too much of a headache of how and where to store it. The truth is, this product can be used as a car ramp as well although it’s mainly intended for indoors. Overall, this is one of the best universal solutions for the joints as back, and you won’t have to worry about the durability unless your four-legged friend surpasses 120 or 130 pounds. HM tip: Consider this the best lightweight universal ramp/stairs for dogs up to 120 lbs available now for a reasonable price. If you are interested in buying an appropriate bed for your four-legged friend to allow some personal space, we strongly encourage you to give a thought to our article about Best dog beds for chewers where we cover the basics when it comes to choosing the one for your needs, as well as reviewing certain products and sharing our tips. Now, we believe we’ve covered quite in-depth analysis of different dog ramps and stairs, and what’s essential when it comes to choosing the most suitable for your pet. If you think we’ve missed a point or two, or there’s another category you’d like us to cover (such us dog ramps/stairs for pools and boats), drop us a note and we’ll consider it as soon as possible. As always, we hope this article has been useful to you and your dear companion.